Scandinavia 35 - The largest sailboat offered by Scandinavia Yachts shipyard. Designed by the famous yachtdesign studio Marc Olivervan Ahlen. Excellent nautical properties and a luxurious and spacious interior - are the main features of this yacht. Well balanced rig with an area of ​​more than 60m2 guarantee fast shipping joy and fulfillment standard shipping category A is a guarantee of safety during ocean voyages. Hand in hand with excellent shipping goes luxuriously finished and spacious interior with a width of 4 m and a length of berths in cabins up to 2.15 m! Full Furnished kitchen and a spacious bathroom make the company and its guests feel at home. In Scandinavia 35 designers abandoned classical navigation table, laptop case and maps cleverly invested in the table located in the mess. 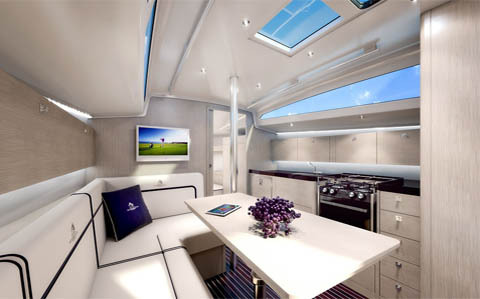 Comfortable corner sofa and a large amount of space to make the perfect place for shared meals, navigating and center "manned life” on the yacht. 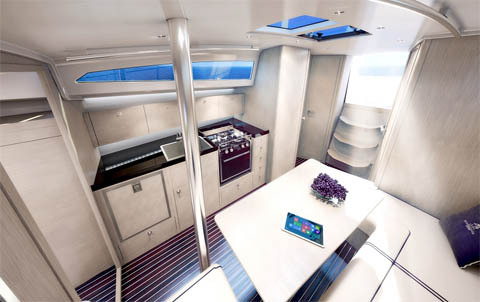 Three cabins feature the longest in its class yacht berths and cabinets along with a comfortable seat that make each person staying on the yacht will find in it their portion of intimate, personal space ideal for relaxation. Scandinavia Shipyard plans to build a yacht Scandinavia 35 in three versions: shipowner (3 cabins, a spacious kitchen and large bathroom) and charter (3 cabins, standard galley and bathroom, extra bed in the cabin) and performance (puristic version with gennaker, carbon fiber finished prepared for transoceanic regattas and marine). A multitude of options and interior configuration that makes every customer can made yacht for himself „tailored” depending on the needs and priorities. We really like the shipowner version where the interior is decorated in the style of Stokholm White-is the leading style of interior design for Scandinavia Yachts products for the upcoming season. Dominant bright colors, and thoughtful interior lighting makes the interior more spacious and becomes more cozy, inviting to spend time in it.